John shares the principles that shape every individual’s success by focusing on Relationships, Equipping, Attitude and Leadership. 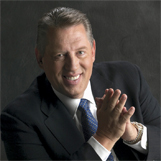 John Maxwell guides his audience through a series of questions, that, when answered, help individuals make good decisions and maximize every moment to achieve their dreams. John challenges every person to make today the most important day in an effort to build toward a better tomorrow with simple principles, tips, and how-tos that anyone can immediately apply.